World Flower -B is a level in World Flower in the game, New Super Mario Bros. 2. The completion of this level unlocks World Flower - , skipping World Flower -2 and World Flower -3. This is an aerial level with many bouncy mushroom platforms and Lakitus. Mario begins on some colored blocks beside some ? Blocks. One of them contains a Super Leaf. Then, a bouncy mushroom platform, a bouncing Spiny and a set of orbiting Brick Block platforms can be found. This follows with another bouncy platform and another Spiny. Over a colored block, more bouncy mushrooms and Spinies can be found. A short rainbow-colored platform follows where a multi-Coin Block can be found. After a few more mushrooms and Spinies, a Lakitu appears. 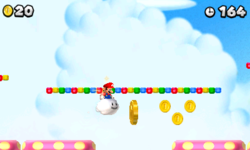 A Gold Ring can be found above one of the bouncy platforms, causing Lakitu to throw coins instead. Another set of orbiting Brick Block platforms can be found. This follows with the Checkpoint Flag. A Roulette Block can then be found, followed by some orbiting Brick Blocks and a Red Ring. Mario then crosses over several bouncy mushrooms on rainbow-colored elevated platforms. A Coin Roulette Block can be found along the way. Another set of orbiting Brick Blocks can be found, followed by the flagpole. Star Coin 1: When Lakitu appears, Mario needs to jump on it and obtain its cloud. Then Mario needs to fly up towards the right to find the Star Coin and several coins. Star Coin 2: Immediately after the Red Ring, Mario needs to hijack a Lakitu's cloud and travel under the rainbow-colored platform on the left side to find a yellow pipe. Warping through takes Mario to a small area, where the Star Coin and a ? Switch can be found. Activating the ? Switch causes four Coin Roulette Blocks to appear temporarily, allowing Mario to climb up and reach the high Star Coin. Star Coin 3: Also after the Red Ring, the Star Coin can be found under a rainbow-colored platform. At this point, the Lakitus appear below that platform and throw Spinies upwards. Mario needs to jump on the Lakitu and hijack the cloud, then float over to the Star Coin. This page was last edited on March 13, 2019, at 02:49.